I don’t usually write to two days in a row. Basically I never write you except on Thursdays. But I decided to make an exception today. 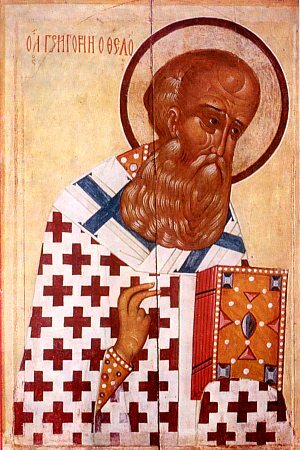 In the East today is the commemoration of one of my favorite saints, Gregory of Nazianzus. I thought it would be a good idea to recommend him to you. You are in your last year of seminary. Next year you will, God willing, be serving in full-time pastoral ministry. It is time to be thinking about what the nature of ministry really is. I could say you need to “think theologically” about pastoral ministry, or I could say you need to develop a “theology of” pastoral ministry. But that sounds so academic. I want you to get deeply invested in understanding what the Church really is, and what your role will be as a pastor. Those are things that are not defined by sociological characteristics or market forces or the ever-changing whims of culture. The Church belongs to God and needs to be defined by God. We don’t invent it or create it. It is theological work to explore and articulate the nature of the Church, discerning God’s view of the matter as best we can. Likewise the ministry, which serves God and the Church, also belongs to God. We don’t invent it. We are called to it by God and we inherit it from the Church and the generations of its servants who have gone this way before us. It is theological work to explore and articulate the nature of the ministry, discerning God’s views of the matter as best we can. This is an important point, and one forgotten at our peril. Instead of defining who we are as ministers and what we do in ministry in theological terms, we develop our views on the fly, based on the demands of the churches that we serve and the tendencies of our culture. So we end up sometimes thinking the pastor is a counselor, sometimes an administrator, sometimes a teacher, sometimes a recruiter, sometimes a cruise ship activities director — and who knows what else. The result? Not living from the center of yourself, not grounded in a vocation defined by God, you find yourself broken in pieces, pulled in every direction, trying to be everything everyone else wants you to be. So why do I suggest Gregory of Nazianzus as a mentor and guide? He’s most famous for his role in defining aspects of the doctrine of the Trinity. (You may think that’s abstract stuff, far removed from Christian living, but really it is the core of everything: The Trinity is the God we follow, and love, and trust, and serve. If we misunderstand God we miss the boat entirely.) You can read his most important bits on the topic in his Five Theological Orations. But he was famous for many centuries for his role in defining the nature of Christian ministry. Early on, when he was first called to serve, he basically ran away in fear. He wrote a defense of why he did that (which you can read for free here). That essay, or speech really, became the classic explanation of what ministry is — and why it might be scary. For centuries, when people wrote about ministry they borrowed their best bits from Gregory whether they mentioned him or not. It is great stuff, though the available translation is dated, and Gregory’s style is unfamiliar to modern readers. The minister, as steward of God’s mysteries, the gospel, the Word, the Sacraments, is charged with helping others in the path to salvation. The minister has to be someone who has directly approached God, and been transformed. That’s the only way a minister has any real wisdom to offer in helping other people live into the life of transforming communion with God, which is the Christian’s calling. That’s the real requirement. Anyone who hasn’t drawn near and known God personally is basically a fool to take up the calling. Only if you stay near to God can you guide others near to God. There is a lot more there, both in Gregory and other ancient, medieval, and Reformation teachers about ministry. But today is Gregory’s day, so I offer him to you! There’s no better way to draw near to God for the personal transformation that equips us for ministry than to work at your prayer life. My annual lenten prayer class starts soon. If you want to be sure to get notified when it is open for registration, click the button and get on the waiting list. A sobering blog entry. It is very difficult to stay near to God. Everything wants to pull you away…. Indeed. It is also the main thing. I think you’ve read “The Cloud of Unknowing.” The task of contemplation, or perhaps we should say communion, is paradoxical: the finite is trying to connect with the infinite. And we don’t have the sensory apparatus to grasp anything except created things. So rather than expecting to “stay” connected, the wiser hope is to return to connection, again, and again, and again. Timely!!! I think you need to send this letter to us about every six months. Or at least every February 1st. Thanks so much for this, Gary. It’s a reminder of high points on my journey, both as a Christian and as an ordained minister, and also a reminder of the many ways I need to keep striving. Just the other day I mentioned to someone your UDTS commencement address that to be the best minister you can be, you must be the best Christian you can be. It’s the only speech in which I’ve remembered the message, and it guides me in my role as pastor. I am so grateful for the wisdom and resources you share so freely that continually bring me back to what really matters, namely, my relationship with God. May God continue to bless you richly as you have blessed us! Thank you Ruth! I’m so honored that you remember that address. Your affirmation means so much! Such a profound thought – and I believe this applies to all of us, not just those called to “official” ministries. Our world and our churches could indeed be radically different if we lived and served from our true center. This particular series is written most directly to pastors, but I always hope that there are things applicable to others as well. Glad you found this to be so in this post!